While doing research work on the Rime [Rimé, Ri-me]* movement in the 1970s, I had the opportunity to meet and interview a number of prominent Tibetan lamas, including His Holiness the Dalai Lama and the heads of the four main schools of Tibetan Buddhism. I prepared a questionnaire, and one of the questions I asked was whether they believed that the other schools of Tibetan Buddhism showed the way to attain buddhahood. I have never been so rebuked in my life as when I asked that question! All of them, without exception, were shocked and insulted, feeling deeply saddened that I, a monk, could ever have such doubts. They would not speak with me until I persuaded them that this was one of those unimportant, procedural questions that are part of the modern university system. “How can you say such a thing?” they rebuked me. “All the schools of Buddhism practice the teachings of the Lord Buddha.” They went on to discuss how all four Tibetan schools share the same monastic code, the Sarvastivada Vinaya, and practice the Mahayana way of training the mind. All of them investigate the ultimate truth through Madhyamaka philosophy, and follow the two great charioteers, Nagarjuna and Asanga. On top of that, all the Tibetan Buddhist schools one-pointedly take the Anuttarayoga tantras as their main, heart practice. Therefore, there is no actual basis for sectarianism, and all the schools essentially follow a Rime approach. 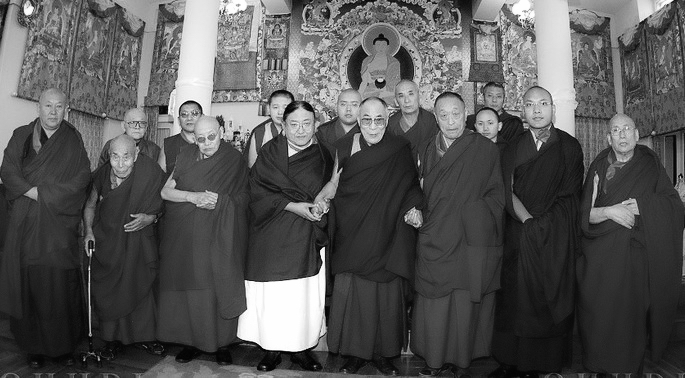 Taken a few years ago, the picture above shows His Holiness the Dalai Lama with other members of the Sangha, including the then heads of the four traditions, standing under an image of Buddha Shakyamuni. Ri or chok-ri in Tibetan means “one-sided,” “partisan,” or “sectarian.” Me means “no.” So, Ri-me* means “not taking sides,” “nonpartisan,” or “nonsectarian.” It does not mean “nonconformist” or “noncommittal,” nor does it mean forming a new school or system that is different from the existing ones. Followers of the Rime approach almost always follow one lineage for their main practices. Although they respect and learn from other traditions, they would not dissociate from the school in which they were raised. 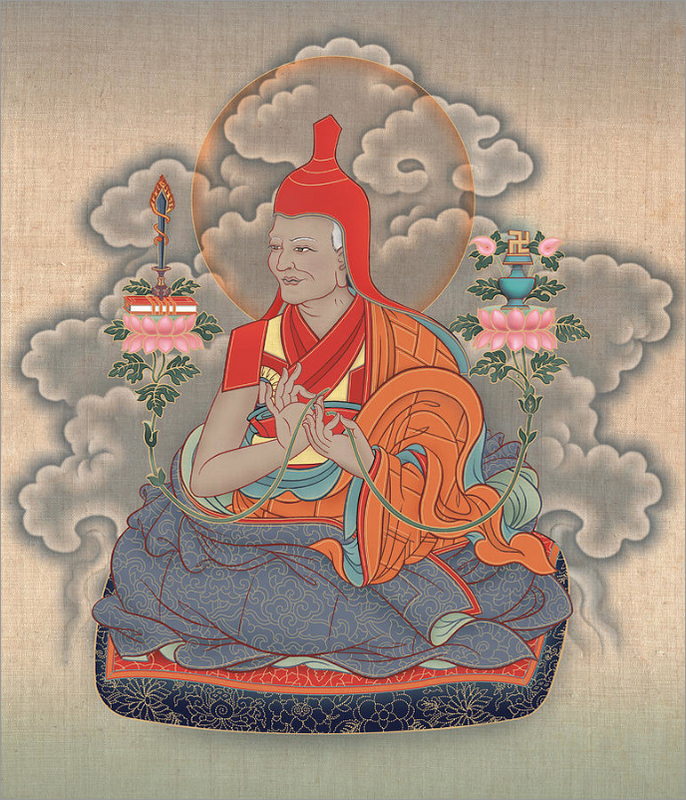 One can take, for example, the founders of the Rime movement, Jamgön Kongtrul (1813–1899) and Jamyang Khyentse Wangpo (1820–1892). Kongtrul was educated in the Nyingma and Kagyu traditions, and Khyentse was raised in the Nyingma and Sakya traditions. Although these two scholars and meditation masters received, collected, practiced, and transmitted the teachings of all eight practice lineages, they never failed to acknowledge their affiliation to their own schools. One of the unique features of Buddhism is the acceptance that different paths are appropriate for different types of people. Just as one medicine cannot cure all diseases, so one set of teachings cannot help all beings this is a basic principle of Buddhism. One chooses the most appropriate sutras and/or tantras from the Buddhist canon and makes them the basis for one’s practice. This is how different schools of Buddhism begin. There are no “sects” in Buddhism because there are no groups that break away from the main school. Different lineages have come into being even among those who practice the same teachings. In Tibet, like other places, the different schools practiced and studied in rather isolated environments, without much contact with other schools and lineages. A lack of communication breeds misunderstanding. Even where there was no misunderstanding or disrespect to other schools, some practitioners, in their enthusiasm to keep their own lineages pure and undiluted, went so far as to refuse teachings from the masters of other lineages, and would not study the texts of other schools. Ignorance is the most fertile ground for growing doubts and misconceptions. A sectarian person is not worthy of being a holder of the dharma. Not only that, he is unworthy of upholding even his own tradition. But arrogant ones bend that to their own interests. But who would be foolish enough to think that those who cause discord are holders of the dharma? Rime is not a way of uniting different schools and lineages by emphasizing their similarities. It is basically an appreciation of their differences and an acknowledgment of the importance of variety to benefit practitioners with different needs. Therefore, the Rime teachers always take great care that the teachings and practices of the different schools and lineages, and their unique styles, do not become confused with one another. Retaining the original style and methods of each teaching lineage preserves the power of that lineage experience. Kongtrul and Khyentse made great efforts to retain the original flavor of each teaching, while making them available to many. Some people are very fussy about the refutations and affirmations of the various tenets, becoming particularly attached to their own versions, such as Rangtong or Shentong Madhyamaka. There are many who try to pull others over to their own side, to the point of practically breaking their necks. When Jamyang Khyentse teaches the different tenet systems, he does not mix up their terminology or ideas, yet he makes them easy to understand and suitable for the students. It cannot be understood by the conceptual mind. The ultimate truth is not only beyond the dimension of language and expression, it is beyond intellectual understanding. So, the ultimate nature cannot be established by the samsaric mind, no matter how deep that mind may be. The scholars and siddhas of the various schools make their own individual presentations of the dharma. Each one is full of strong points and supported by valid reasoning. If you are well grounded in the presentations of your own tradition, then it is unnecessary to be sectarian. But if you get mixed up about the various tenets and the terminology, then you lack even a foothold in your own tradition. You try to use someone else’s system to support your understanding, and then get all tangled up, like a bad weaver, concerning the view, meditation, conduct, and result. Unless you have certainty in your own system, you cannot use reasoning to support your scriptures, and you cannot challenge the assertions of others. You become a laughing stock in the eyes of the learned ones. It would be much better to possess a clear understanding of your own tradition. If, in trying to understand the truth, one dispels misunderstandings, and therefore some philosophies cannot remain intact, that should not be considered as criticizing others’ views. In the treatises of the Buddhist teachings, one can make distinctions of higher and lower views, where the higher ones clarify points in the lower ones. Other than that, they do not improve on the lower ones or go against them. In clarifying what needs to be clarified, they do not undermine the basic principles or repudiate the lower teachings. Therefore, all the teachings of the Buddha are of one taste; they are seeking the nature of suchness and they end up with the nature of suchness. All of them are like that. There are no differences in the basic teachings, like there being one tenet that asserts the self does exist and another that asserts the self does not exist. By discussing selflessness, all the yanas, lower and higher, examine the root of phenomena and teach the nature of things more and more deeply. They are not discussing different bases. Since the Hinayana and Mahayana and the higher and lower views have no separate bases or separate paths, that means they have no separate results. This needs to be understood. Some traditions discuss slightly different ways of entering the path, but these can easily be joined into one system. For example, the Shravaka system clears away all doubts about the selflessness of the person within the aggregates, sense fields, and consciousnesses. The Mahayanists do not say they have a different understanding of personal selflessness, and that it is higher or an improvement on the Hinayana understanding. Nor do the Mahayanists say that the Hinayana understanding is wrong. The Mahayanists see a need to clarify further that the aggregates, sense bases, and consciousnesses are not substantially existent dharmas. However, they do not undermine the basis of the Hinayana understanding by asking questions about the aggregates, consciousnesses, and sense bases, like where they exist, to whom they are known, what their characteristics are, and so forth. They do not undermine the basic understanding by statements like “the self and the world do exist, but the aggregates, sense bases, and consciousnesses do not exist.” If that were the case, then the higher Buddhist tenets, like Yogachara, might say something completely different. But it is not like that; all the Buddhist teachings have the same basis. All the Buddha’s teachings are of one taste and one way; nothing is excluded within the state of vast equality. For example, all the small streams flow into large rivers and then accompany the large rivers to flow into the ocean. Within the vast ocean, all the rivers have the same taste of salt. Similarly, all the small entrances of the lower yanas are small rivers of understanding personal selflessness, which wash away the dirt of the belief in substantial entities. 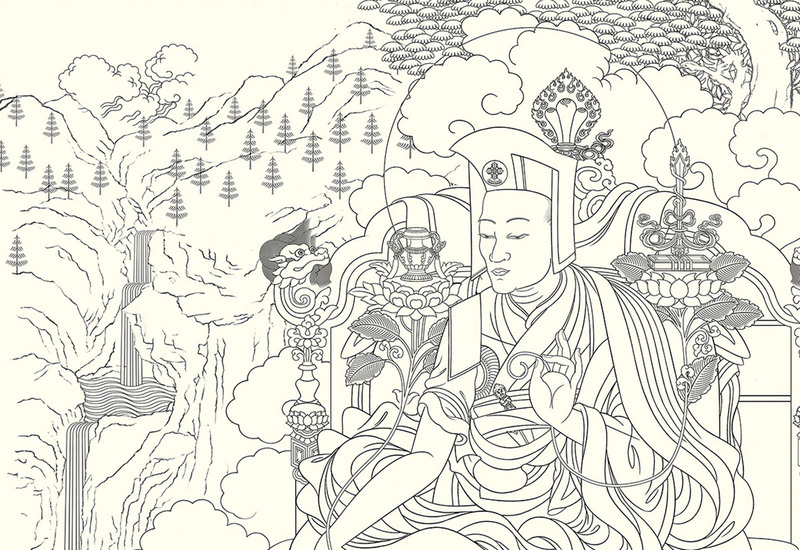 They join the large rivers of the Mahayana sutras and all of them end up in the great ocean of Dzogpa Chenpo. There is not even a particle of dust that does not become of one taste with this great, vast equality. Manjushri, the karmic obscuration of rejecting the noble dharma is a subtle one. When one thinks that some of the Tathagata’s teachings are good and others are bad, then that is rejecting the dharma. By rejecting the dharma, a person is criticizing the Tathagata and expressing negativity toward the sangha. If someone says, “That is right and this is not right,” then that is rejecting the dharma. If one says, “This is taught only for the bodhisattvas,” or “This is taught only for the shravakas,” or “This is taught only for the pratyekabuddhas,” then that is rejecting the dharma. Those who are very learned from their study of the five branches of knowledge and other topics, and those who have reached the stage of warmth in their meditative experience, receive predictions and are directly cared for by their lamas and special deities. These learned and accomplished masters truly benefit the teachings and beings through their activities of teaching, debating, and writing. Those who use reason and debate meaningfully to refute misunderstanding and establish right understanding are great masters, whether they come from our tradition or another tradition. If we look deeply to find their real intention and do not look in a wrong way, their presentations strengthen our understanding. Rather than causing harm, they are highly beneficial. What Khenchen Kunpal says is true. That is why the two emanations of Manjushri, Khyentse and Kongtrul, together with their students and lineages, have the conviction that all the great tenets of Buddhism arrive at the same ultimate point. They do not act in sectarian ways; they do not try to bring people over to their side, nor are they attached to their own traditions and hateful toward others. They instruct us to hold all the teachings within our mindstreams without contradiction, and when it is our turn to teach the dharma to others, we should explain it and emphasize the main points just like the great charioteers of the past. We should not change the teachings or corrupt them even the tiniest bit. If two philosophers agree, one is not a philosopher. If two saints disagree, one is not a saint. The legendary, ten-year debate between Chandrakirti and Chandragomin is a good example. Both of these masters are regarded as realized beings by all sides, so why did they debate? Their debates rested on how to phrase the teachings to have the least danger of misinterpretation. For both Rangtong and Shentong Madhyamaka, all phenomena included in the relative truth are emptiness, and there is the cessation of all fabricated extremes in meditation. Their views do not differ on these points. However, in relation to post-meditation, to clearly distinguish the tenet systems, merely in terms of the way they use terminology, Shentong says that the dharmata, or true nature, is there, and Rangtong says the dharmata is not there. In the ultimate analysis, using the reasoning that examines the ultimate, Shentong says nondual primordial wisdom is truly established, and Rangtong says primordial wisdom is not truly established. These two statements delineate their main differences. So, their difference lies in the words they use to describe the dharmata and primordial wisdom. Shentong describes the dharmata, the true nature, as ultimately real, while Rangtong philosophers fear that if it is described in that way, people might understand it as the concept of a soul or atma. The Shentong philosophers think there is a greater chance of misunderstanding if the enlightened state is described as unreal and void. Their debates rest on how to phrase the teachings to have the least danger of misinterpretation. Kongtrul finds the Rangtong presentation best for dissolving concepts, and the Shentong presentation best for describing the actual experience. Is clearly taught in all the sutras and tantras. These teachings correlate with the Semde teachings of Dzogchen. And the view of Mahamudra. 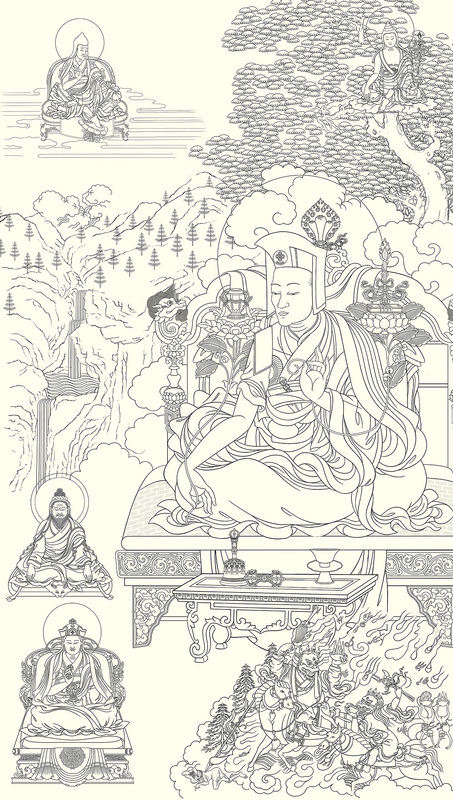 The Dagpo Kagyu, the Mahamudra, and others. But in his book the Commentary Praising Selflessness, he personally accepts the view of Mahamudra. Is indisputably the same as the tenets of Dzogchen. This is clear in his text the Sublime Medicine, the Amrita of Questions and Answers. They teach meditative absorption beyond concepts. Called the Geluk-Kagyu Tradition of Mahamudra. These quotations should make Kongtrul’s perspective on nonsectarianism apparent. When we examine the lives of the great Tibetan masters of the past, we find that they studied with many teachers of different traditions and lineages, and had great respect for them. The conflicts between lamas and monasteries, and sometimes between regions of Tibet, have sometimes been presented as religious or doctrinal conflicts. However, almost none of them had anything to do with doctrinal or philosophical disagreements. Most of these conflicts were based on personality problems or mundane political rivalries. The Rime movement of Kongtrul and Khyentse was not a new concept, but it was a timely and unique movement with great consequences. A great portion of Buddhist literature would have been lost but for the efforts of these two luminaries to preserve it. Although Khyentse was the source of inspiration and greatly contributed toward this effort, it was Kongtrul who actually put together the gigantic collection of the Five Great Treasuries. The compilation and transmission of the Five Great Treasuries, together with the Compendium of Sadhanas and the Compendium of Tantras, broke the isolation of single lineage teachings in the majority of Tibetan Buddhist schools. These collected works made possible a tradition that has developed in the twentieth century of receiving the teachings of various lineages and schools from a single teacher in a single place. Take, for example, the Treasury of Instructions, one of the collections of Kongtrul’s Five Great Treasuries. This compendium of most of the essential teachings of the eight practice lineages is now preserved and transmitted as one lineage. Transmitting teachings of this kind has become not only common but popular among the masters of all schools of Tibetan Buddhism. The great success in this field goes back to the fact that Kongtrul gave these teachings himself, many times over, to a wide range of students, from the heads of schools to the humblest of lay practitioners. Many among his wide range of students spread these teachings in their own schools and monasteries. Also, Kongtrul was able to have almost all of his major works carved into wood blocks and published while he was still alive. When the Tibetans started coming out of Tibet in 1959, the entire Five Great Treasuries of Kongtrul were available. From 1960 onward, His Holiness Karmapa and His Holiness Dudjom Rinpoche started giving transmissions of these collections in India. 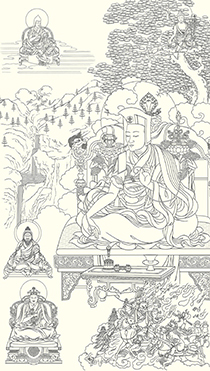 It is well known that the only Tibetan books that Chogyam Trungpa and Akong Rinpoche brought when they first came to England in the early 1960s, besides their daily practices, were the volumes of Jamgön Kongtrul’s Treasury of Knowledge. His Holiness the fourteenth Dalai Lama has been strongly influenced by several great Rime teachers such as Khunu Lama Tenzin Gyaltsen, Dilgo Khyentse Rinpoche, and the third Dodrupchen, Tenpe Nyima. Due to the efforts of nonsectarian teachers like these great lamas, in recent years there has been more interchange of teachings among different schools of Tibetan Buddhism than ever before. Following the tradition of Rime, the Dalai Lama has been receiving and giving the teachings of all schools in their respective traditions and lineages. The slight understanding I have of the Dzogchen view has come from Je Tsongkhapa’s notes called the Secret Explanation of the Forty Letters, which is a commentary on the Guhyasamaja Tantra. * The Tibetan word རིས་མེད་ (Wylie transliteration ris med) is most often rendered phonetically in English as Rime or Rimé. The book by Ringu Tulku, however, uses the uncommon transcription Ri-me. For the sake of congruency with the more common transcriptions of the word, and to make the material more accessible, the online presentation of the first chapter of his book uses Rime instead of Ri-me. » The opp. of རིས་ཆད་ [ris chad] q.v. 1) A general term with many uses. The base meaning is that one has not sided with one particular position, view, or faction. Hence “unbiased”, “impartial”, “non-sectarian”. 2) The name of a renaissance movement that begin in East Tibet in the mid-19th century and which became particularly influential afterwards. The movement developed around the first Khyentse and Kongtrul Rinpoches. The two were non-sectarian in the sense that they were willing to study all traditions and find what was good in all. Tibetan Buddhism at the time was very fixated on following your own system, whatever it was, and not even looking at what others had to say. Thus the name also implied “ecumenical movement”. » <noun> “Bias”, “partiality“, “sectarianism”. The noun form of རིས་སུ་འཆད་པ་ q.v. The opp. is རིས་མེད་ [ris med] q.v. When discussing the actuality of mind, as happens in discussions of the ground in Mahāmudrā and Mahāti systems, it is used to refer to the nature of mind not becoming fixed as any one thing or another. In that case, the term has the sense that the nature of mind just does not fall into becoming one side or the other of a dualistic situation. RINGU TULKU RINPOCHE was born in Kham Lingtsang, in eastern Tibet, and was recognized by His Holiness the Sixteenth Gyalwang Karmapa as the incarnation of one of the tulkus of Ringu monastery, a Kagyu monastery in his home province. He is a Tibetan Buddhist Master of the Kagyu Order. As a young child he had to flee from Tibet and grew up in exile, in India. He was trained in all schools of Tibetan Buddhism under many great masters such as H.H. the 16th Gyalwa Karmapa and H.H. Dilgo Khentse Rinpoche. He took his formal education at Namgyal Institute of Tibetology, Gangtok and Sampurnananda Sanskrit University, Varanasi, India and has served as Professor of Tibetology in Sikkim for 17 years. His doctoral thesis was on the Rime Movement in Tibet. Since 1990 he has been traveling and teaching Buddhism and meditation at more than 50 Universities, Institutes and Buddhist Centres in Europe, USA, Canada, Australia and Asia. He also participates in various interfaith dialogues. He authored several books on Buddhism as well as some children’s books both in Tibetan and European languages. Ringu Tulku’s books include, Path to Buddhahood, The Ri-me Philosophy of Jamgön Kongtrul the Great – A Study of the Buddhist Lineages of Tibet, Confusion Arises as Wisdom, Mind Training, Daring Steps – Traversing the Path of the Buddha. For more books see: Lazy Lama Series / Heart Wisdom Series. 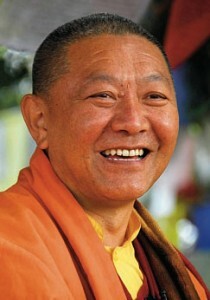 Ringu Tulku founded Bodhicharya (www.bodhicharya.org), an international organization that coordinates the worldwide activities to preserve and transmit Buddhist teachings, to promote inter-cultural dialogues and educational & social projects. He also founded Rigul Trust which supports his projects in his birthplace, Rigul, Tibet (www.rigultrust.org). Ringu Tulku Rinpoche is the Official Representative of His Holiness the 17th Karmapa, Ogyen Drodul Trinley Dorje, for Europe and the Founder of Karmapa Foundation Europe (www.karmapafoundation.eu). 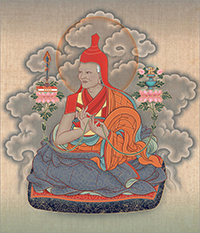 Chapter I of The Ri-me Philosophy of Jamgön Kongtrul the Great: A Study of the Buddhist Lineages of Tibet, Shambhala Publications (2006), pp. 1–14. See harmony in all doctrines. Receive instructions from all teachings.